Israeli Minister in Armenia: Damage Control or Something More? Armenia-Israeli relations have been somewhat distant, complicated by the latter's strong ties with Yerevan's two biggest foes, Azerbaijan and Turkey. But a senior Israeli official has visited Yerevan amid signs that the politics of the Caucasus in Jerusalem may be shifting. Tsachi Hanegbi, Israel's Minister for Regional Cooperation, visited Armenia on July 25-26, for talks with senior Armenian officials. Hanegbi is a key figure in prime minister Benjamin Netanyahu’s ruling Likud party and has held various ministerial positions for the past two decades. Hanegbi said that his visit was intended as a “breakthrough” in relations to make Armenia-Israeli “friendship mutually beneficial in many fields.” It was the first visit by a senior Israeli official to Armenia since 2012. Relations with Israel have remained distant since Armenia gained independence in 1991, as Jerusalem has prioritized its ties to Turkey and, more recently, Azerbaijan. As early as the 1990s, pro-Israel groups in Washington aided Turkish and Azerbaijani governments in lobbying battles with the Armenian American community, just as Ankara and Baku reached out to Israel for security cooperation. And although Israeli-Turkish relations have soured somewhat under the rule of Recep Tayyip Erdoğan, Azerbaijan has become the main supplier of crude oil to Israel and has spent billions on Israeli weaponry. Israeli-supplied arms played a critical role in last year's “April war” between Armenia and Azerbaijan. After Azerbaijan took several frontline posts in a surprise attack on April 2, 2016, Armenian forces undertook a counteroffensive. But Israeli-supplied Harop suicide drones and Spike anti-tank missiles helped Azerbaijani forces thwart that counterattack. As it happened, an Israeli parliamentary delegation was in Yerevan that same day. Knesset deputy speaker Tali Ploskov, who headed the delegation, reportedly “strongly condemned” the Azerbaijani attack in Karabakh and called for return to the ceasefire. In subsequent days, Armenian ambassador Armen Melkonyan delivered a formal protest to Israel over the weapons. Another Knesset member, Zehava Gal-On from the opposition Meretz party, called for a halt to Israeli weapons sales to Azerbaijan. Gal-On also claimed that a key proponent of relations with Azerbaijani, current defense minister Avigdor Lieberman, acted as a “foreign agent” on Baku’s behalf and benefited financially from the relationship. While Israeli leftists, particularly the late Meretz leader Yossi Sarid, have long sympathized with Armenians, centrist and right-wing politicians have been more distant. That has been changing somewhat. Since 2013, the speaker of the Knesset has been Likud’s Yuli Edelstein, who supports recognition of the Armenian genocide. Since 2015, Ze’ev Elkin, who also supported Armenian issues in the Knesset, has emerged as a key figure in the Netanyahu cabinet. In April of that year, the Likud delegated Knesset member Anat Berko to events marking the genocide centenary in Yerevan. And this year, a controversial right-wing figure Avigdor Eskin, who had previously been sympathetic to Azerbaijan, made a surprise visit to Nagorno Karabakh. It remains to be seen if Israel is in fact seeking to strike a more balanced relationship with Armenia or if the talks were merely damage control. 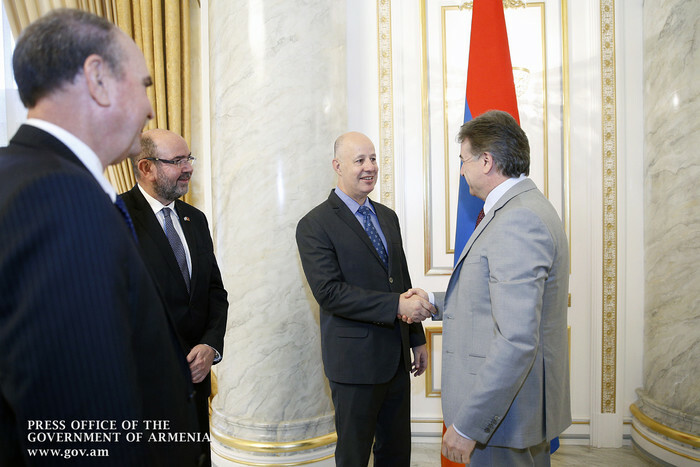 According to the Armenian government’s press release, in a meeting with Hanegbi Prime Minister Karen Karapetyan identified information technology, agriculture, healthcare and science as areas where Armenia was eager to study Israel’s experience and find areas of cooperation. Following Hanegbi’s meeting with foreign minister Eduard Nalbandyan, the latter’s deputy Shavarsh Kocharyan said that “real steps” were being taken to establish closer ties. Asked about Israel’s weapons sales to Azerbaijan, Kocharyan suggested that Israel was ready to sell weapons to Armenia as well.